Hand quilting versus machine quilting . . . . is it really a question? We are often asked this question here at Amish Spirit and typically end up discussing the virtues of both methods. What we’d all really like is to get that combative “versus” out of there! If you haven’t been to our home page, please be sure to stop by and read our story and that of the community of women who make this amazing art. And, of course, additional personal note (every quilter has “a story”) about my own Grandma Louise who, many years ago, was taught to hand quilt by a member of this same tiny community. In her lifetime, my grandma became quite the accomplished quilter. 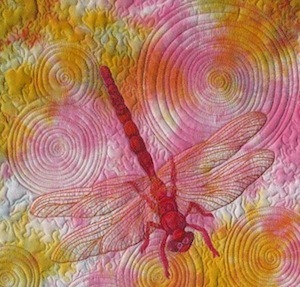 She joined a small group of women who eventually took on piecework (quilt tops) and used the money earned via hand quilting and finishing the quilts to fund various local non-profits. When she was 90, she felt I was serious enough for her to pass the torch, so to speak. Personally, I think she finally realized that I’d caught the same disease whereby I could NEVER pass a fabric store without stopping in “just to see”. We spent many hours in her back bedroom, leaning over a quilt rack my grandpa made for her in the late 1950’s, which was later handed down to me. Finally, the process took hold for me. I think for our Amish friends and myself we hand quilt because it’s a process that has been passed down from mom to daughter to granddaughter. 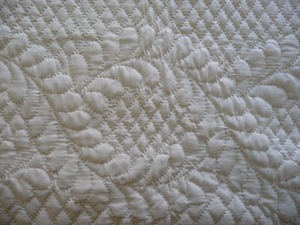 While everything here at Amish Spirit is hand quilted, machine quilting is equally beautiful and enhancing to a quilt. We have all seen amazing and inspiring patterns machine quilted into the patterns of gorgeous pieces. During a recent vacation we spied a machine-quilted piece on a wall in a bed and breakfast. As with any quilter, I flipped the quilt to the back to better see the quilting and was pleasantly surprised to see mermaids had been perfectly machine quilted all over this piece! 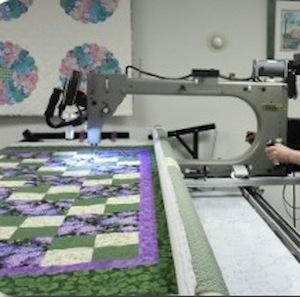 While machine quilting can be done over a far shorter timeframe, the cost can be significant when you consider the special machines, threads, rulers, rotary cutters, etc. When all is said and done there are things that can be done via machine quilting that just cannot be done by hand, and vice versa. 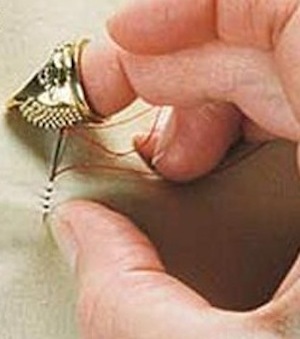 Most quilters use both methods: hand quilters also machine quilt, machine quilters also hand quilt. So really, why the “versus”? Making a quilt can be a monumental task, and, no matter how you quilt it someone somewhere is going to treasure that heirloom quilt for a very very long time.